Well who’d have thought that day would ever happen? 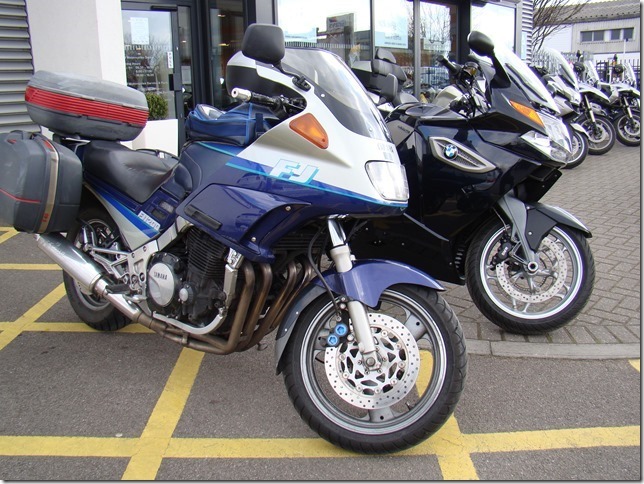 Back in the day (May 94), your author took a train down to Bournemouth in Dorset and went to buy a Yamaha FJ1200 from an unfortunate chap who had lovingly owned her for three months until the dreaded Child Support Agency deemed he had to get rid of her. In this time only 300 odd miles had been put on the clock and having handed over the dosh, I proceeded to gingerly ride the 80 odd miles back to Woking Surrey where upon arrival at my works premises I realised I’d had no insurance for the journey. Cover started just after id photocopied the V5 form before sending the slip off to the DVLA. This bike would become a feature in the Roake family, affectionately known as “Nigel Mansell’s Arse”, as the former champion had arrived at Mclaren with more pounds around his hips than the new car could cater for, and in what can be only labelled as unprecedented, the boys from Woking made a new car for him from scratch in 33 days .Four months of daily grind without a day off had given me the funding to go buy a new bike and this ‘94 registered beast was the object of my dreams. Known in the circles of bike fans in the USA, as the Velvet Sledgehammer, (because the bike had a performance which belied its looks, and frequently went a lot quicker than you thought you were doing, whilst giving a lovely soft ride due to a decent seat), this bike started life in 1983 as an 1100cc which didn’t quite work as a sports bike and would eventually be branded as a sports tourer. Lasting in production until 1996 in 1200cc guise, this was the bike that would fulfil an old ambition of mine to go touring Europe comfortably and having bought an old copy of Motorcycle International in ‘82 which suggested if you ever went touring, then the place to go was Switzerland and the seven mountain passes near Interlaken, the old article which had been safely tucked away was dug out and resurrected and planning commenced. One minor problem to be addressed, the other half (Jo), had never been on a motorbike let alone round Europe, so as a “get used to it trial”, what better way to be thrown into motorcycling , than to leg it to the Bristol Balloon festival and camp overnight returning the following day. 100 miles each way wasn’t much of a test compared to the 453 we did on the first day the following weekend as we headed off towards Switzerland fully loaded up. Suffice to say the trip went down a storm just like the weather which following five continuous days in a three man dome tent of rain, can be strained when you can’t even stand up in it. This was the week that Lady Diana perished in Paris, and whilst saddened at her passing, we only found out as we detoured to a hotel on the way home near Arras in France for heat and showers. L 159 EFX was to be a constant in my life for 19 years and rarely cost much to run and never actually let me down, although she did have an appetite for maintenance free Gel batteries in the early days until I bought a house with power in the garage and a trickle charger that was a third of the price of a battery and extended the life by years. She was substantially modified over the years with all the motor racing stuff like Aeroquipped brake lines and stage three Dyno jetting with the obligatory K&N filter. Better front brakes were probably the best £70 ever spent on EBay since R1 callipers were a straight swap and encouraged one finger braking. The other Eureka moment was the day I got rid of cross ply tyres for Avon radials and realised that the bike could actually make the sweeping bend onto the M3 near me without washing out starting on the inside and ending on the outer part of my lane. However all wasn’t sweetness and light in FJ world. The machine had an appetite for belly pans at £150 each and by number four I gave up fitting them as sleeping policemen had supported Yamaha spares sales for long enough. You also reach a point in a relationship where you get peed off using plastic weld under the fairings to keep them together and there is only so much resonating a guy can stand. With the writing on the wall, test rides for a replacement ensued. In January 2012 the path had taken me to the local Bavarian Motor Worken dealer in Guildford who thought £500 excess on a test ride hack was acceptable .After telling him to shove his attitude I went to another who only wanted £15 for a day’s cover and allowed me unlimited access to a bike which I took out for six hours and 185 miles just to prove it did what it was supposed to. I even tried an older type of German bike with cylinders opposite one another but as the sales guy said, “It’s a marmite bike mate – love it or hate it”. I was in the latter category as the thing vibrated for the motherland. It just never seemed to settle down to me and in only 50 miles I was giving it back. Coming up to date , swayed by ABS brakes ,a 200 mile fuel tank range, heated grips and seats , Cruise control , traction control, a headlight that actually works and shaft drive for those of us who always hated adjusting chains , the day came to trade in the old girl, for my new lover. Call me sentimental, but a simple request to photograph the old and the new together got the whole flipping dealership outside checking out the old bird who still commanded a decent part ex price even if she was too old to feature in their glasses guide. Did I have remorse at the loss of an old friend? Not a bit of it! Out with the old and in with potentially my last ever bike (if she lasts as long), and happy days are here again, even if I did remember to insure her this time around. Since the purchase day, it’s continued to rain but who cares – she’s in the garage waiting for the call. It made me laugh when my long standing friend from the MOT station told me off for buying something that 55,000 had died for during the Second World War trying to stop, and now I’d sold out to the enemy. I guess he isn’t a fan. All the Beemer needs now is a decent nickname, but she sounds like a whirler more than a grunter …answers on a postcard please. Steve Roake, April 2013.